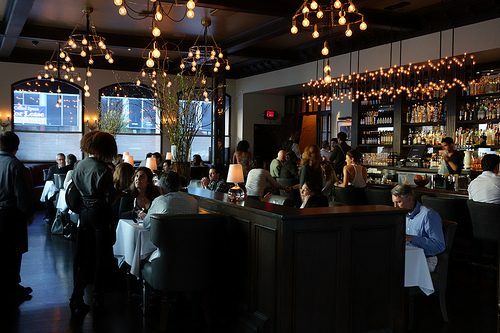 When I was invited to check out the new restaurant Crossroads, in the old Philippe space on Melrose, I was told two things. 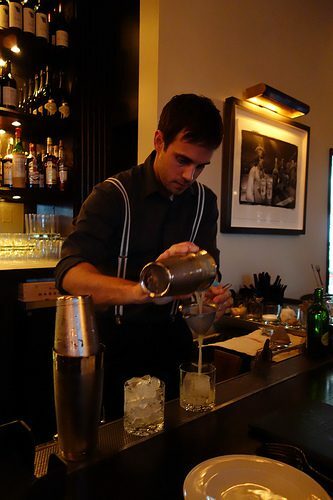 First, Beverage Director Jeremy Lake is doing the cocktails (Jeremy worked at Rivera and Playa previously and I was excited to check out his new place). Second, it’s a vegan restaurant. I love my vegetables but I especially love cheese, butter, ice cream…..and of course, meat. So naturally I was a bit hesitant about going out to dinner at a vegan restaurant. Would I be satisfied with the flavors? 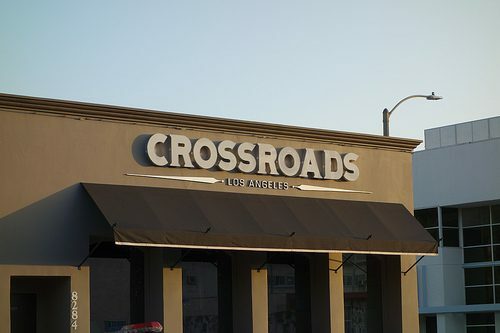 Well, as a proud omnivore, I must say, if I hadn’t been told, I would never have known that Crossroads was a vegan restaurant. The cocktails were excellent as was the food (and very satisfying). Starting with the cocktails, Jeremy has created a menu that looks like any quality, farm-to-table cocktail program, however all of the cocktails are vegan. What does this mean? It means you won’t find any fizzes or sours which contain eggs and the liquor brands used also don’t fine or filter with animal products. 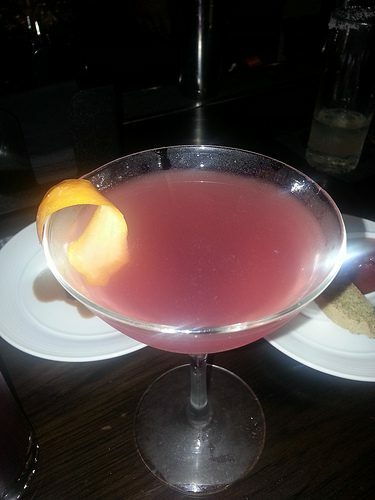 Viola Haze (Fair quinoa vodka, Combier, Creme Yvette, lemon, maraschino) – This is an Aviation for the vodka lovers. Sparkling Kitty (red wine, Cava, lime, ginger syrup) – Similar to a Moscow Mule but made with wine and the Cava adds a nice fizz. 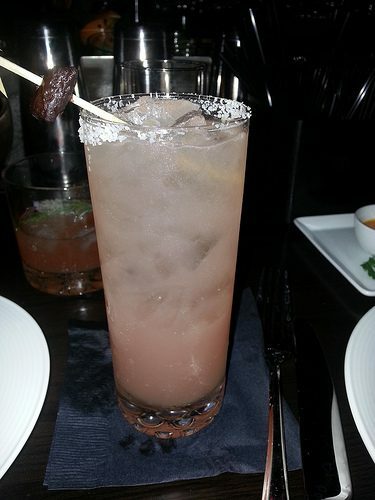 Sophia (Alipus mezcal, tequila blanco, lime, grapefruit, kalamata olive syrup, candied olive garnish) – It looks pretty and pink but with tequila and mezcal and kalamata olive syrup, this balanced cocktail has smokey and salty notes. 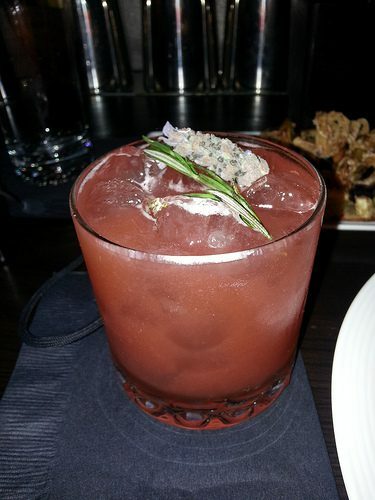 Shotgun Willie (Barbancourt rhum, strawberry-lavender syrup, lime, roasted rosemary) – This cocktail pays homage to Willie Nelson and the smokiness of the roasted rosemary went well with the strawberry-lavender syrup. Mayflower (Pimm’s No. 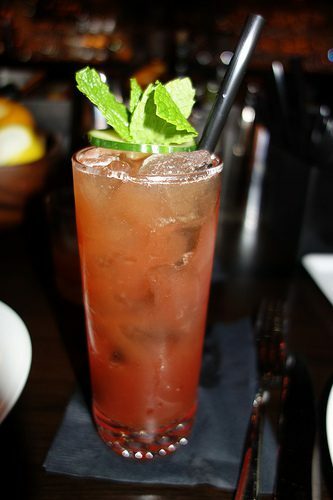 1., Plymouth gin, St. Peter’s English Ale, Campari, orange, cucumber, mint, lemon) – A beer cocktail that is refreshing and can be enjoyed on its own or paired with food. 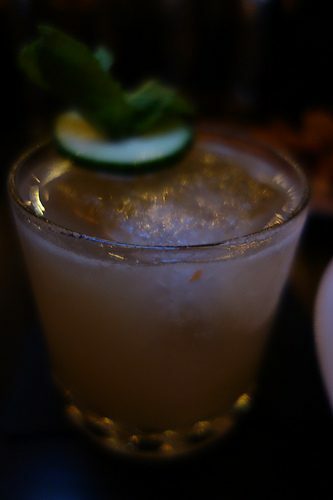 Buoys & Birds (Monkey Shoulder Scotch, cucumber, mint, lime, atomized Islay Scotch) – A refreshing whisky drink. As for the food, the menu, created by Tal Ronnen, is Mediterranean-themed and the small dishes are meant to be shared….so we did! 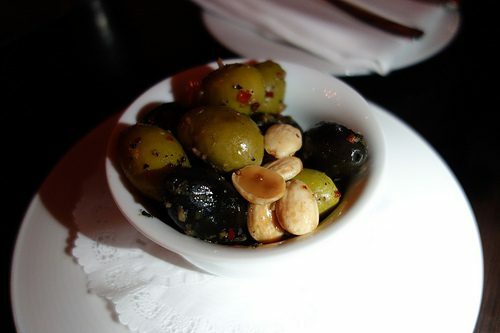 A snack of Marinated Spicy Mediterranean Olives and Fried Marcona Almonds was a great start to enjoy with our first cocktails while we perused the menu. 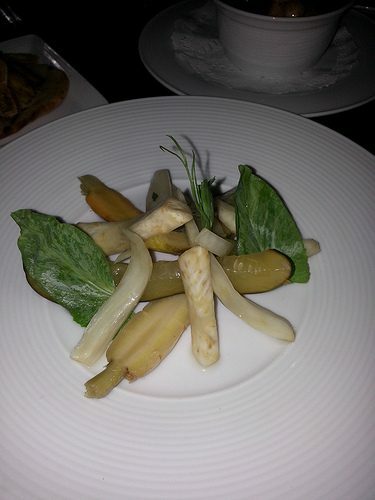 Housemade Pickled Vegetables had a great crunch and tang and were also a great start to wet the appetite. 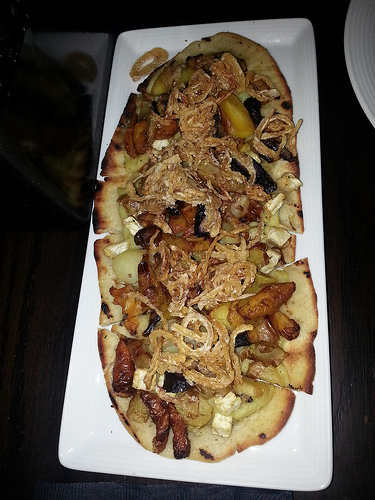 Leek and Spring Root Vegetables Flatbread was full of flavor and texture. This was one of my favorite dishes. 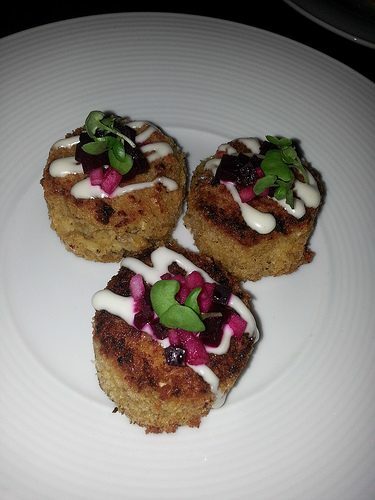 I was hesitant at first when I saw “Crab Cakes” with Hearts of Palm, Charred Corn Relish and Basil Aioli. 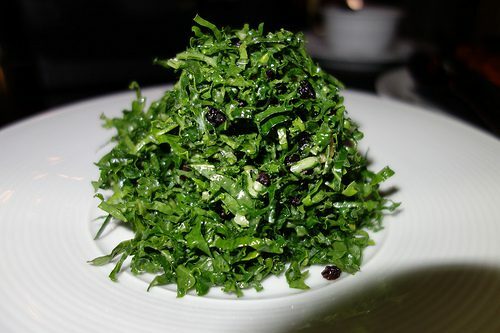 I always wonder why vegan dishes refer to non-vegan cuisine. But, oddly, the fritters of hearts of palm and apples topped with diced beets actually had the texture of a crab cake and was my other favorite dish of the night. An oyster dish….well, oyster mushrooms, that is. 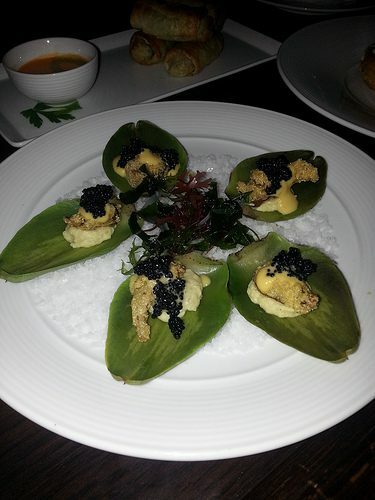 Artichoke Oysters with Artichoke Purée, Crispy Oyster Mushroom, Yellow Tomato Béarnaise and Kelp Caviar – The crispiness of the fried mushrooms and the freshness of the artichoke leaves matched well with the “creamy” sauce. 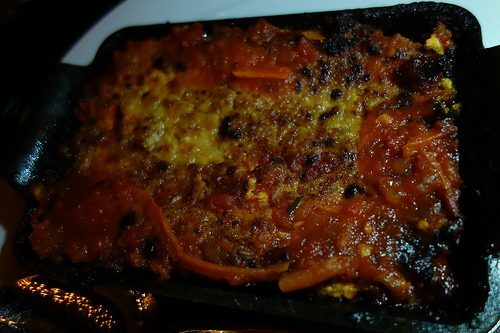 Wood-Fired Meaty Lasagna – Calling this “meaty” when there is no meat in it had me a little worried about the texture and flavor but the soy meat substitute, the crispy vegan cheeses and tangy tomato sauce made this a very flavorful vegan lasagna. Vanilla Bean Panna Cotta screams “not vegan” in every sense. But although I have no idea how they made this dairy free, it was creamy, smooth and full of flavor. I actually scraped the dish clean. So so yummy! 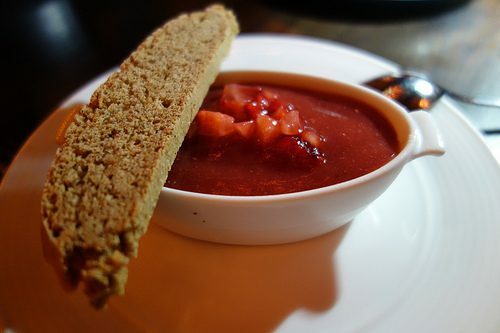 Crossroads in an upscale restaurant that offers all of the vegans in LA a fine dining option. 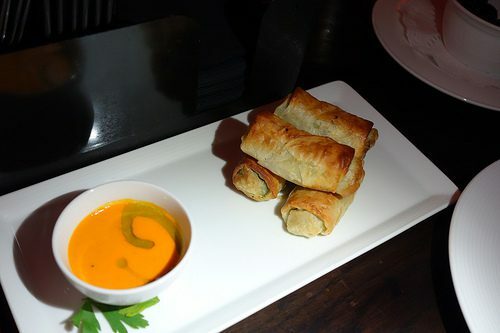 But, Crossroads will also appeal to the “meat” eaters and introduce (and satisfy) all with clean, flavorful cuisine. I am looking forward to going back! 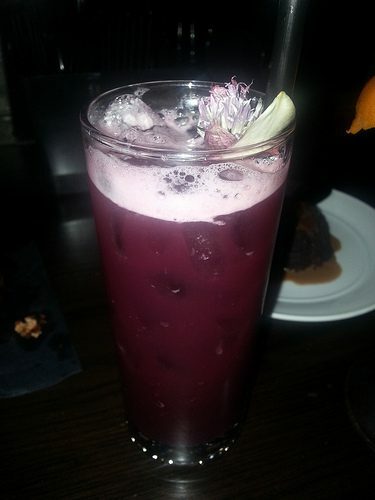 This entry was posted in Cocktails, Food and tagged Crossroads, Jeremy Lake, Melrose Ave, Tal Ronnen, vegan by Allison Levine.